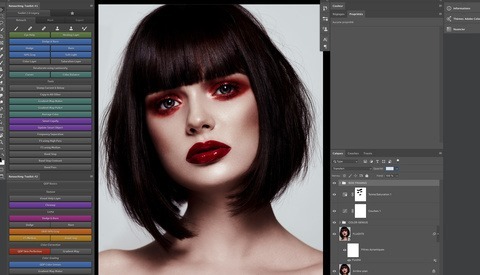 It's been a little while so I reasoned some new free Photoshop Actions were in order! As you may recall, I create Actions based on simple processes I find myself doing regularly in my retouching workflow, mostly in the interest of convenience and efficiency. Today, however, I've essentially updated a previous Action I gave away, now dubbed Smart Flare. Let's break down what it does and why. I admit it, I like haze effects in my glamour and fashion work. So much so that I intentionally avoid said effects (most of the time) to ensure I don't pigeonhole myself worse than I already am. So, having done flare effects so often (both in camera and in post) it only makes sense that I've found several different approaches to creating certain looks. While most truly dynamic light flare effects should be done manually (or include the use of Knoll Light Factory, for example), the simplest type of postproduction light flare can be summarized as simply haze. That is, big white areas of puffy, blurry "light" that's blended over existing light "hot spots" in the shot. Thus my original Auto Flare Highlights Action was born. However, like all Actions, it was immediately limiting and (to me) cumbersome when I wanted to change the look of the effect radically as I went about my workflow. If you know me, you know I believe in manually processing your images instead of relying on Actions or Plugins. At the same time, I understand why the use of either can be of immense benefit. That said, I still prefer flexibility and control over simply clicking a button and blindly accepting the end result. Today's Action is called Smart Flare. Why? Because it utilizes an often underused aspect of Photoshop Smart Object layers. While the tutorial video above isn't a thorough primer on Smart Objects, it is still a decent way to get introduced to the concept if you haven't tried them before. And even if you use Smart Objects on the regular, maybe this Action will add some little touches to your light effects laden images that you'll like. Marissa Gerik shot in Dayton, Texas. Kathrine Haus shot in downtown Houston. Savanna Little shot in Bellville, Texas. Right on, I think I'll do some experimenting with this... Cool write up man. Do you have a preferred way for warming or cooling the flare effect? I can think of a few ways to accomplish this but since you have more experience with the action I wanted to see if you had a method that works best. Adding areas of "paint" (color) is seldom a great way to cool or warm certain areas (like haze/flare) unless you are utilizing blending modes. Another option is to create the haze/flare "shapes" (either with my Action or however you want), then use one of several adjustment layers to colorize that area - but use the "shape" of the haze/flare as the mask for said adjustment layer (select the luminosity of haze/flare layer by command+clicking the layer thumbnail). Fantastic tutorial- short, clear, and with great examples. I appreciate your tutorials and actions on here!